Hang up your clothes immediately after taking them out of the dryer. Another reader pointed out that after you wash clothes made from fabrics you can’t tumble dry, you should flap them around a bit before putting them on a drying rack. Related: Do you strictly follow label directions that advise “lay flat to dry” vs. “hang dry,” or just put everything on drying racks? Get a clothes steamer. 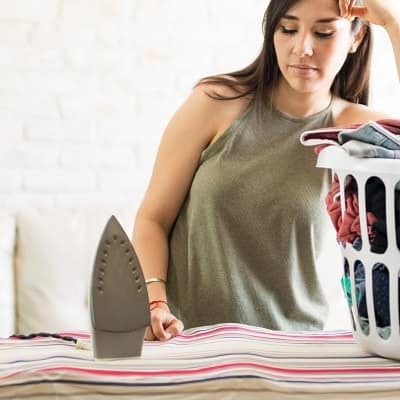 One reader who bought a steamer on Amazon says it allows her to avoid ironing knits and other workwear items, although she doesn’t advise using it on tailored button-front shirts. (This $26 steamer looks great!) Another said that she uses one on her suits (and notes that she always hangs up her suits after wearing). Wirecutter recently shared their picks for the best steamers, and two recommendations from readers are the Esteam Personal Hand Held Steamer ($75) and Steamfast SF-407 ($50) [affiliate links]. Try throwing wrinkled clothes in the dryer for a few minutes. One reader says that a 10-minute spin in the dryer works well for smoothing out t-shirts, sweaters, dress pants, and non-iron shirts. She adds a wet towel as needed, while a reader who replied said that she uses a handful of water. (Another said this trick removes pet hair, too.) My dryer even has a “Freshen Up” setting that I assume is designed for this, although I haven’t tried it. Use Downy Wrinkle Releaser (or a similar product). Amazon sells a 2-pack of 33.8-oz. sprayer bottles (almost 1,000 reviews) for $13.24 and also has a pack of 3 travel-size bottles for $7.97 [affiliate links]. One reader recommended a cheaper and more natural option: Put the item of clothing on a hanger and use a spray bottle filled with water. Be a clothes-folding minimalist. One reader said that she reduces the creases in her shirts by only folding them once — in half vertically, down the middle of the shirt. What are your tips on how to iron your clothes less? Do you use a clothing steamer, and if so, would you recommend the one you have? How much do you base your clothes-buying decisions on whether something is likely to wrinkle easily (linen, 100% cotton, and so on) or whether it requires dry cleaning? Stock photo: Deposit Photos / tonodiaz. I don’t buy things that need to be ironed. Done! I may be a freak that finds ironing slightly therapeutic, but dealing with a steamer seems to take just as long without giving you crisp smooth fabric. And wrinkle releaser/fabric softener drives me nuts between the extra chemicals, slight fragrance and the weird, too-smooth texture it creates. My biggest tip for making ironing ITSELF go faster is to get stuff out of the dryer immediately or to hang-dry items neatly. You don’t have to waste time or elbow grease reversing the effects of a dried-in crease that way. I save up ironing for when I want to call family to pass the time — in the hour I spend chatting with my mom, the week’s laundry is ironed and put away! I love to iron, actually. This morning I was contemplating whether it was completely bonkers to iron my sheets. I don’t dry most of my clothes in the dryer to prolong their usefulness, and I never use fabric softener because for some reason I thought it’s not good for the clothing. I dry almost everything on a drying rack and then iron while I’m getting ready in the mornings if I’m wearing something that needs ironing. It takes me about 1 minute to iron a shirt, so I’ll just plug in the iron before I get in the shower, then iron immediately after shower. By the time I’m finished getting ready, the shirt is cool. I find steaming to be much more of a hassle. For blazers, dresses, etc., I hang them immediately when I get home and take them off, and I’ve found the wrinkles typically fall out between wearings. I almost never wear pants, and the pants I do wear don’t require ironing. If they did, I do think I’d send those to a cleaner because I’ve never been able to get the crease right. I hate ironing but don’t mind steaming. But mostly, I solve the problem by buying clothes that don’t wrinkle easily. Hang immediately and lower your standards. My shirts aren’t crisp, and they’re not completely devoid of any tiny wrinkles. They don’t look like they’ve been dry cleaned and professionally pressed, basically. But they are _mostly_ wrinkle free, and perfectly presentable, and that’s good enough for me. Speaking of ironing, I have a stupid question . . . do people still starch their clothes? I have this dress from Ann Taylor that looks nice, until it wrinkles, and it gets rumbled up pretty easily, often before I even get to work! My office isn’t exactly casual, but I’d still like to look put-together and I’d hate to give up on this dress before I get my money’s worth! Could a little starch do the trick, is that even a thing? Or is there a better solution? The good news is that it usually looks fine when it comes out of the dryer and I rarely need to iron it. When I iron, which isn’t that often, I do use a bit of starch or sizing, depending on the garment. I do not own an iron and have not for some time. Things that get washed are folded and hung up right out of the dryer. Blouses, suits/dresses, court robes and my husband’s shirts all go to the cleaners. I consider this an investment in myself – my time is worth too much to spend it ironing. That said, I found a great cleaner where all cleaning is half price if you drop off on Sundays, including winter coats. If anyone is in mid-town Toronto, I can hook you up! I actually really enjoy ironing. It’s probably my favorite household task: you’re bringing order out of chaos with every pass. I will put on a podcast in my bedroom and gladly iron for as long as it takes. Sleeves and collars first, is my only tip. Plus ironing anything that could get shiny inside out and on the proper temperature setting. If you have a button down, I like to iron on the back side of the placket with the buttons. Ironing also has the advantage of being one household chore where you don’t get dirty, don’t get wet and don’t have to smell chemicals. You just stand there and make things look neat and pretty again. I don’t iron. But I have a partner who does, so I’m happy to throw those “just can’t airdry these flat” items his way. This reminds me of my husband’s grandmother, she used to wash and IRON the curtains every Tuesday. What is that about?!?!?!? I’m happy if the clothes get washed, forget about ironing the non-work ones…but CURTAINS? LOL!! My grandma used to iron her underwear! And once a week, no less! Wow. My grandma ironed bedsheets and bath towels. I only leave things in the dryer long enough to warm and fluff out the wrinkles. Then I hang everything either on a drying rack or on hangers. If it goes on a hanger, I make sure the collar is laying nice and neat and button a few buttons so the shirt hangs neatly. Then let everything air dry. I run a dehumidifier in my laundry room so that helps a lot with the drying process if I need things to dry in a hurry. 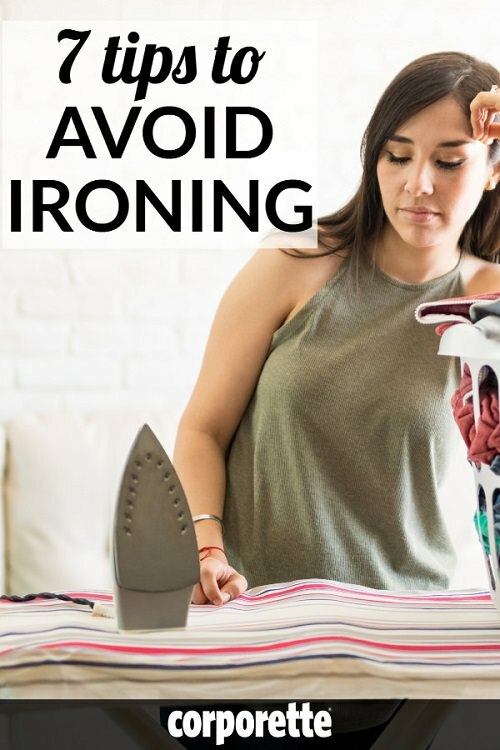 If you take the time to do this, very few things will need ironed — and if they do need any ironing, it’s really just a quick touch-up here and there. There are bonuses to this process – less time in the dryer is easier on your clothes, and it’s easier on your electric bill. Also, in the winter, the damp clothes add moisture to the drier air. If you have problems with the air in your house being really dry (you’ll know this by lots of static, chapped lips, dry skin) the moisture evaporating from your clothes air-drying will help! A few caveats. If you need something dry in a hurry and can’t hang it outside, this is not a fast process. (when we had a woodburner, I’d hang things right above it and they dried super fast! We now have a pellet stove and it’s not quite as quick a process.) If you do this with rayon, you’re still going to need to iron. Rayon is just one of those fabrics that is a royal b*tch and does not look nice unless it is ironed. Just gotta live with the fact. I do use the dryer for some things — towels, sheets, gutchies, things I don’t mind if they get wrinkly (because I do have a bad habit of leaving things in the dryer for hours or days after it shuts off!) but for the most part, I’m hanging the majority of what I wash. I LOVE ironing and steaming! I grew up in a humble household, so looking nice was a huge things for both my parents and that included polishing my shoes and ironing my uniform. I steam shells and pants that are on a second+ wear, but iron anything that needs to be ironed (cotton). Ironing is much easier (same for steaming) if you have a REALLY good iron and steamer. Why is a steamer not good for buttondowns? I was considering getting one, and buttondowns are basically the only thing in our household it would be used for. Everything else I can get away with hanging damp. I don’t think I have ironed anything in 5 years. What are you all wearing that requires so much ironing? I guess I don’t wear a lot of pure cotton to work, nor do I wear much silk. My dryer has a steam setting. Best thing ever. For my business casual wardrobe, it works really well. There are a few things it doesn’t work on that I still have to iron, but not every single week like I was doing before. My boyfriend irons his sheets, as well as his shirts, and that’s one of the small things I find endearing about him. I avoid ironing through buying clothes that don’t need it and/or trying to hang clothes quickly from the dryer. This would be for washable, ‘casual’ items, light knits, etc not something that needs a knife edge crease or to look formal, but it is surprising how well it works. And it’s great when traveling – a tiny re-fillable spray bottle is easy to pack and you won’t look as though you rolled out of your suitcase! (btw – I ‘pop’ the collars of shirts when spritzing or hanging to dry – they seem to lay flatter after they dry).